The MARSIS instrument on board Mars Express has found evidence of ancient buried basins in the Martian northern lowlands. 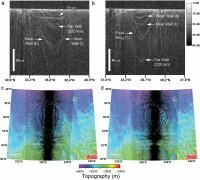 The discovery of these sub-surface features provides important constraints on the geological history of the Martian crust and in particular the division between the heavily cratered southern highlands and the smoother lowlands on the northern hemisphere. MARSIS (Mars Advanced Radar for Subsurface and Ionosphere Sounding) is a low frequency, nadir-looking pulse limited radar sounder and altimeter. It can transmit a linear frequency modulated radio signal using the nadir-looking dipole antenna and subsequently record the return signal to isolate sub-surface features in the Martian crust. Optimal conditions for obtaining radar sounding data with MARSIS occur for around 30 minutes per orbit. This is due to an altitude constraint, less than 800 km above the Martian surface, and to observe on the night side where the negative impact from ionosperic activity is minimised. Location of buried basins discovered by MARSIS displayed on a MOLA relief map of Mars. The MARSIS data, gathered over the northern lowlands during more than 30 orbits in June and July 2005, revelaed a dozen buried basins in Chryse, Acidalia, Amazonis, Elyisium and Utopia Planitia. The results are presented in a Nature article by a group of planetary scientists led by Thomas R. Watters. The buried basins have diameters between 130 and 470 km and are shown in black on the global map of the Martian surface relief on the right (obtained by the Mars Orbiter Laser Altimeter, MOLA, on board the Mars Global Surveyor). A buried basin shows up as one or more arcs in a MARSIS radargram, which is a plot of the measured intensity of the received return signal as a function of time-delay and position. The shape of the arcs in the radargram are compared with those in a simulated radargram from the ~230-km diameter impact basin Kepler. Radargrams (top) and derived ground-range projections (bottom) from MARSIS data obtained over Chryse Planitia during two orbits. The radargrams can be transformed into ground-range projections. These are symmetrical around the ground track and show the size and location of the basin. The symmetry is an operational effect. MARSIS detects the reflected signal from left and right of the ground track at the same time and a single observation cannot distinguish between the two signals. As shown in the alongside image of Chryse Planitia, this ambiguity can be resolved by combining multiple observations from adjacent ground tracks. The newly discovered sub-surface basins provide an indication of the age of the crust in the northern lowlands. The density of craters with a diameter larger than 200 km in the northern lowlands, is calculated from the detected number of basins and the area covered by the observations, which is about 14% of the northern lowlands. The crater density translates to a crustal age by comparing it to densities derived from models of the cratering history in the Solar System. The crater density found by Watters et al. indicates that the northern lowland crust is ancient and dates back to the Early Noachian epoch (from the formation of the planet to 4000 million years ago). This time frame is consistent with that for the formation of the southern highlands. This is in contrast to the previously held assertion that the formation of the northern lowlands is a relatively recent geological event. The implication, therefore, is that models which predict the evolution of the Martian surface also need to undergo revision. Because there is a possibility that some of the buried basins were not detected in the area surveyed, the crater density might be higher and accordingly the derived crustal age is a lower limit. One of the factors that influences a successful detection is the difference in electrical characteristics between the materials that form the basin and those that fill and cover it. When the dielectric properties of the top layer are similar to those of the basin material, the contrast between them can be too low to detect with MARSIS.